Brian Marcotte, president and CEO of the group, indicated only 33 percent said they would offer only a high deductible plan in 2016, up from 32 percent in 2015. “It’s the calm before the storm. Companies are taking a wait and see approach,” Marcotte said, referring to the possibility that Congress could repeal the Cadillac tax. In the meantime, companies are looking everywhere to better control rising health care costs. Expenses for specialty pharmaceuticals, which can cost up to $10,000 for a month of treatment, are on the radar. Traditional pharmacy spending is expected to grow 3.9 percent in 2016, but specialty pharmaceuticals by 22.3 percent, says the National Business Group on Health, citing a report by Express Scripts, a pharmaceutical benefits management firm. Among the drugs fueling the increases are Sovaldi and Harvoni, drugs approved last year for the treatment of hepatitis C that can cost $1,000 a pill. In 2012, 53 percent of specialty drugs were paid through the traditional medical benefit, which means they are mainly injected at a hospital, doctor’s office or another health care provider. That’s a problem for employers because health care providers can bundle the expense with unrelated charges, hiding the drug’s actual cost. 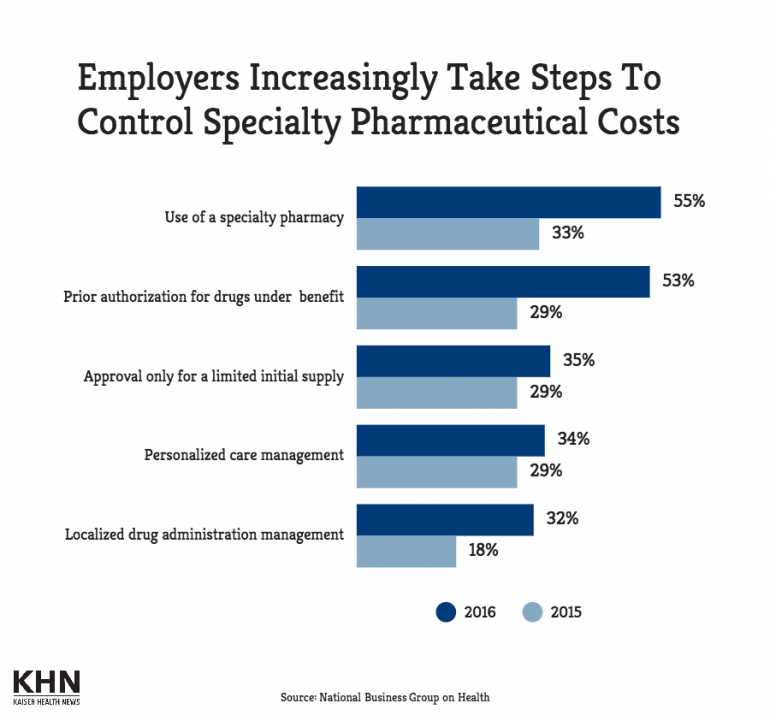 Specialty pharmacies are more transparent about drugs’ costs. Moving those drugs to a specialty pharmacy can save an average of 19 percent for employers, though patients may pay a large portion of the cost, according to a study from health care consulting firm Avalere. Specialty pharmacies also help companies spend efficiently, by calling patients regularly to ensure they’re taking their medications, getting prior authorization and initial approval for only a limited supply of specialty drugs. An estimated 10 percent of hospitalizations in older adults may be caused by not sticking to doctors’ orders for taking their medications, according to a 2014 study by the Johns Hopkins Public School of Health.